You probably not a fan of sifting through help files and want an expert guide to image editing in Photoshop Elements. Elements is a sophisticated program which offers you so many tools that it’s tough to know how to use them all. You may need some quick help. Whenever you need a hand, know that you can find valuable help information quickly and easily within Elements itself. If you’re stuck on understanding a feature, ample help documents are only a mouse click away and can help you overcome some frustrating moments. Photoshop Elements Help: Choose Help → Photoshop Elements Help or press the F1 key (Windows) or the Help key (on a Mac with an extended keyboard) to open the Elements Help file. You can type a search topic and press Enter to display a list of search results. Getting Started: Choose this item for tips and information on getting started in Elements. Key Concepts: Choose Help → Key Concepts. A web page opens in your default web browser and provides many web pages with definitions of terms and concepts. Support: This menu command launches your default web browser and takes you to the Adobe website, where you can find information about Elements, problems reported by users, and some workaround methods for getting a job done. You can find additional web-based help information by clicking Photoshop Elements Online and Online Learning Resources. The vast collection of web pages on Adobe’s website offers you assistance, tips and techniques, and solutions to many problems that come with editing images. Be sure to spend some time browsing these web pages. Video Tutorials: Choose Help → Video Tutorials to open a web page where videos for common tasks are hosted on Adobe’s website. Forum: Choose Help → Forum to explore user comments and questions with answers to many common problems. Tooltips can be another helpful resource. While you move your cursor around tools and panels, pause a moment before clicking the mouse. A slight delay in your actions produces a tooltip, which is a small box that describes the item your mouse is pointing to. Elements provides this sort of dynamic help when you pause the cursor before moving to another location. When you launch the Organizer or Photo Editor for the first time, you may see the eLive tab selected by default. 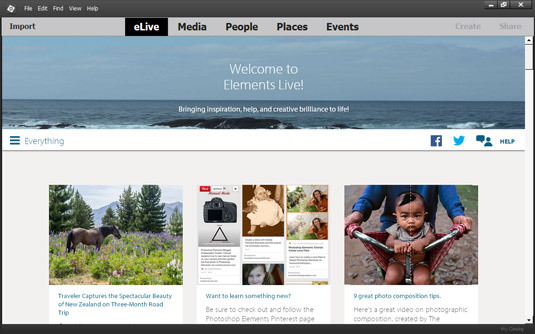 eLive is a new feature in Elements that offers you help, tutorial assistance, and information related to updates. When you first begin to explore Elements, take a look at the various options you have for learning more about the program. Find great help resources on the new eLive tab. Learn: Click this item to learn various techniques in editing photos. Inspire: Click this item to view some inspirational creations. News: Click this tab to view Elements news items such as updates and announcements. The eLive tab shows updated information as Adobe posts it. The interface is web-based and new updates to the individual items occur routinely. Be sure to explore eLive to keep updated with new ideas and announcements.